If you’ve read any of my blog postings, you know that I read the news online and a lot of the time, something I see will prompt me to write an article. This is one of those times. This afternoon, as I was taking a few minutes to peruse MSNBC, a tag line near the bottom of the screen caught my eye. “Common Symptoms of ADD and ADHD in Women,” it said. I followed the link to a slideshow prepared and presented by Healthcentral.com. While I won’t chronicle all 19 symptoms that HealthCentral enumerates, it is a very shocking, yet humbling, list of symptoms for me to read through. As many of you may recall, my oldest son was diagnosed with ADHD last year, shortly after the start of 1st grade. After recognizing many of the same behaviors in my youngest son, he, too, was diagnosed with ADHD this past summer. Much like the color of our eyes and our full-grown height, ADHD is caused by our genetics rather than by bad parenting or environmental factors. Although he was never officially diagnosed, I have spent a lot of time “blaming” my ex-husband for passing along that little bit of DNA. Unfortunately, I’ve had to eat a little bit of crow in the last three months because in August of this year, I was officially diagnosed with ADHD. This is why I state that reading through the list of symptoms is extremely humbling. It is also overwhelming. For 35 years I have struggled with many of the symptoms listed. While I was a very good student in school and never got into trouble, I realize now that I had developed what many mental health professionals call “hyperfocus.” School was a safe haven for me growing up and it was all that I cared about. More than dating, more than sports, more than parties and hanging out; good grades fueled my very existence. By many accounts, I was the nerd, the geek, the party pooper. And, looking back, it is true. Even in college, when even the most straight-laced teen/young adult cuts loose, I didn’t. I recently found a school planner from my senior year of college; it was filled with due dates and notes about when certain papers were due or when I needed to study for certain tests. One of my roommates recently reminded me about how I would refrain from a lot of late night antics because I had to get up early for an 8 o’clock class, even though I had long ago finished the homework or studying for the class. Unfortunately, for many people who have ADHD or have children with ADHD, there comes the challenge of also facing the social stigmas. You must be a bad parent if you can’t control your children, which is closely followed by you must be a bad parent if you medicate your child to help them control their behavior. You must be unorganized at home, work or school. You must be a slacker, or you don’t care, or you are just a poor wife, parent, employee, or student. All of these labels create major problems for those who suffer, especially for women, and for those who remain undiagnosed. Society has women convinced that we should be able to be all and do all. For many women, those goals are lofty; for a woman with ADHD, those goals and expectations can be extremely taxing and can help fuel major bouts of depression and anxiety. The best example I’ve come across is that for a women with ADHD, life is like a juggling act: when there are only 3 balls to juggle, life might rock along okay, but as life starts throwing a few more balls into the mix, we cannot cope or function and the balls get dropped and forgotten. Many of you have actually followed along as I have struggled to juggle some of the balls in my life: school, work, single parenting, disorganization, and struggles with my weight. Almost every single one of my struggles has some background intermingled with ADHD. When I feel bored (mostly because I get overwhelmed with what needs to be done), I eat. I have spent my entire life (and I do not exaggerate – ask my parents what my bedroom looked like growing up, as a child, a middle schooler, and even a teenager) thinking that I was just an overly sentimental packrat, or worse, a hoarder. The truth was I do have some tendencies, but I actually struggle with completing the organizational tasks needed to maintain a neat and orderly home. This is made worse by the fact that both of my children have ADHD and I lack the necessary skills to properly model and teach organization. Much like Superman fears kryptonite, doing laundry is my archenemy because it never ceases and there never seems to be a “project completion” of which I can be proud. 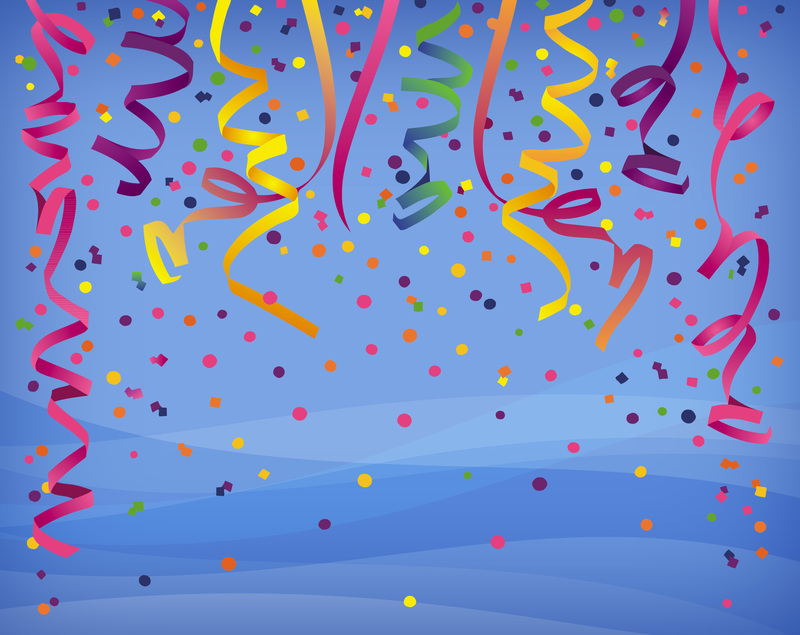 On rare occasions, I find my “mojo” and I get started on grand organizational projects. However, I rarely estimate the correct amount of time needed to complete said project, and the excitement quickly runs out, leaving a house full of unfinished projects and half organized rooms. Growing up, my MO was to shove absolutely everything I could under the bed or in the closet to lend the appearance of a clean bedroom because I honestly didn’t know how to deal with it. Although I am a 35-year-old woman who is a mother and was married for 10 years, quite frankly, I still struggle with this type of “solution” to the mess. Even writing this article was a chore for me. I have struggled long and hard about writing it because it exposes many of my weaknesses. Having finally completed my Masters degree program in August, I am currently in search of a full time job. However, I know that a potential employer/supervisor may uncover this article and view my open admission of struggling with certain organizational tasks as an admission that I cannot function in a certain type of environment. But, my desire to really help other women in my situation outweighs the fact that someone might judge me without taking the opportunity to see my positive qualities and attributes. At the very core of all of this is the fact that ADHD is a real mental illness that affects millions of adults and children. Unfortunately, our society still struggles with the acceptance of mental illnesses as true illnesses that need and deserve to be taken seriously, treated and openly discussed so that others needn’t walk the same path we have walked. Although I champion the acceptance of mental illness, my own ADHD diagnosis was hard to swallow at first, but it was also a relief to know that I was not a bad parent, a bad employee or a poor student. It was also a relief to know that with medication and additional therapy (the most effective treatment combination for ADHD), I won’t always have to worry about the show “Hoarders” showing up at my door. It has given me hope that I can become a more effective parent and, hopefully, break some of the cycle of ADHD symptoms with which the boys and I struggle daily. I have a confession. Maybe it isn’t a confession at all – maybe you’ve known this all along. I don’t get my hair cut every 5 weeks. Or 8 weeks. Or by the same person. Or in the same county. As much as my mom trained me to find a stylist I love, be faithful to her through her inevitable salon moves, and raise my children with her, I just don’t do it. I get my hair cut on a whim, usually when a coupon comes in the mail (this gives you a clue as to the type of places that cut my hair), whenever I’ve got a spare minute. To be honest, I’ve got pretty simple hair. You know which one is me, right? The one with the easy-to-cut hair. And the sign. My hair is long. Sometimes there are bangs. They can go to either side. There are no layers. There’s no added color. So you see, I just can’t convince myself that I need a $50 haircut that necessitates an appointment scheduled a month out. I also don’t cry over my hair – even when I got a really weird set of bangs from an obvious rookie right before (i.e. the day before) a professional photo shoot with my husband and my dogs. My hair straight up looks like crap in those photos and I’ve STILL got them hung in my house. Sometimes I walk past them and literally laugh out loud. I just have trouble caring about my hair. So I walked into Great Clips (Cost Cutters? Hair Xpress? Aren’t they all the same?) and Jacob greeted me at the door. He asked for my phone number (he wasn’t hitting on me) and typed it into the computer. “Is there any reason why I’m not seeing your information in the system?” he asked (and yes, his tone was snotty). Uh, yeah, I thought, I’ve never been here and I won’t be coming back (not because you’ve ticked me off, but because I JUST DON’T CARE!). “Can you just cut my hair as a guest? I’m here from out of town,” I lied. Well, not really. I mean, I wasn’t within 25 minutes of my home. That’s out of town, right? And then I had 8 minutes of silence. It was wonderful. Quick and easy is what I was looking for and that’s what I got. The silence and pretend-spa-feel was a bonus. I was also looking for quick and easy when I came across this barbecue sauce. I sort of love and I sort of hate that it starts with ketchup. It certainly makes the process easier but makes it feel a little less homemade. 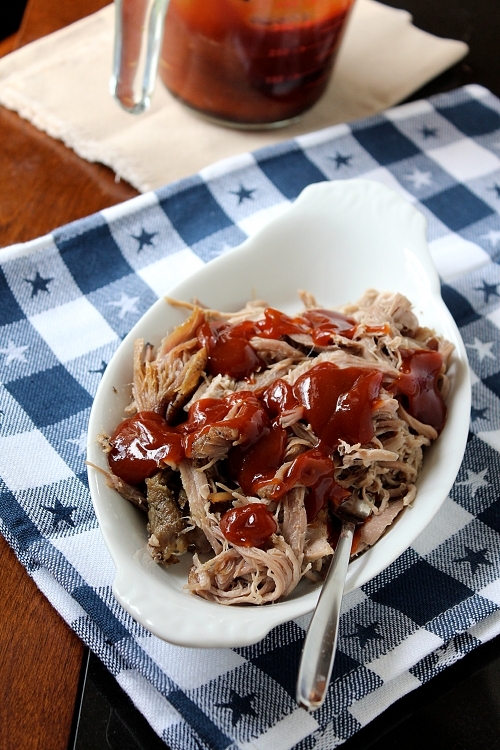 This barbecue sauce tastes really good if you like a tangy tomato-based sauce. I had all the ingredients on hand (the liquid smoke was leftover from vegetarian days gone by), so it was nice to whip up a no-cook barbecue sauce just in time for dinner. My favorite sauce will always be a mustard-based sauce from a local hole-in-the-wall barbecue pit, but this is definitely delicious for a change. Whisk together all the ingredients in a medium bowl. Taste and season with additional salt, pepper, honey, and/or hot sauce if needed. Store covered, in the refrigerator, for several weeks. 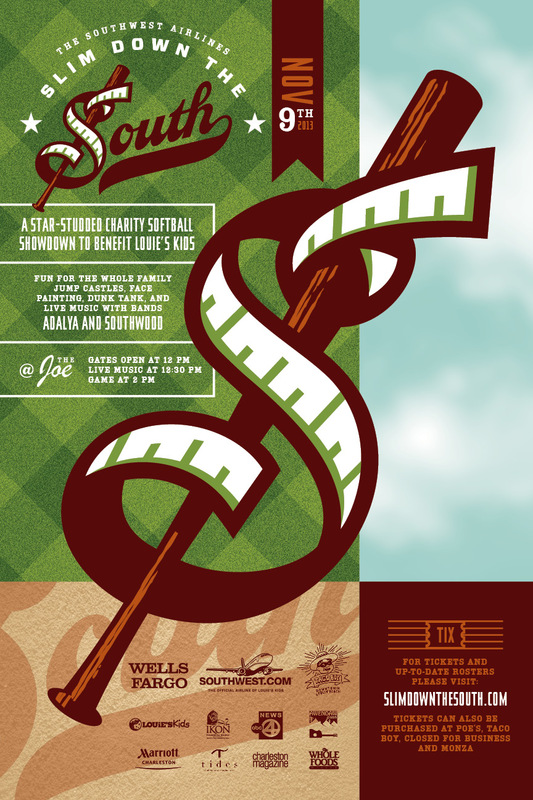 Support a great cause and enjoy a fall day in Charleston on Saturday, November 9 as celebrities near and far play in the 3rd Annual Slim Down the South Celebrity Softball Challenge for Louie’s Kids. The event, which will be held on Saturday, November 9 at Joe Riley Park, raises funds for Louie’s Kids, the only not-for-profit organization in the United States helping identify treatment programs for overweight and obese children. Other celebrities include personalities from Charleston television and radio stations. For more information on Louie’s Kids or Slim Down the South, visit LouiesKids.org or SlimDowntheSouth.com. Founded in 2001 in Alexandria, Va., and operated today out of Charleston, SC, Louie’s Kids is a 501(c)(3) nonprofit organization that raises funds to empower children to make changes, both physically and mentally, for a healthier and more productive life. The mission of Louie’s Kids is to strengthen the future of the communities they serve by making children healthier and improved citizens, while also providing excellent stewardship to those funders who invest their time and treasure in the children served. For information and updates follow Louie’s Kids on Facebook and Twitter. A Midlands woman’s fight against breast cancer led to a discovery that may save the lives of her sisters and daughters. Kathryn Robinson’s cancer battle started more than two years ago. “I was preparing to go to work, and while I was in the shower I just accidentally felt a lump in my breast,” said Robinson. Just a few days after the ultrasound Robinson was diagnosed with breast cancer and life immediately changed for her and her family. “When my mom was diagnosed and she talked about getting genetic testing done, that’s the first time I had ever heard of the gene,” said Robinson’s 24 year-old daughter, Ashley Lyons. Robinson’s family quickly learned about the BRCA gene malformation. It’s hereditary and when present greatly increases the risk of breast and ovarian cancer. 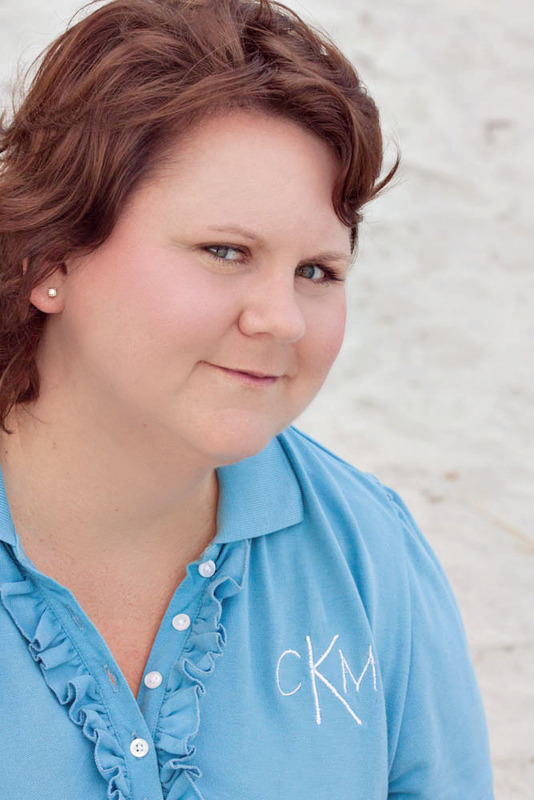 In the midst of chemo, Kathryn tested positive for the gene. “I had eight rounds of chemotherapy, and I was scheduled to do radiation after that, but because I was positive with the BRCA2 gene, they did a bilateral mastectomy,” said Robinson. Doctors at Lexington Medical Center recommended the mastectomy and a hysterectomy in hopes of eliminating Robinson’s future cancer risks. They also advised her family to get tested for the gene. “I had one sister that wasn’t interested in getting tested and a younger sister that I can usually persuade to do just about anything… she went and got tested,” said Robinson. As it turned out, Robinson’s sister Kelly Moore also tested positive for the gene malformation. “I feel like I’m the lucky one,” said Moore. “Kathryn helped to educate me, and I had all of her valuable information for what she had gone through. Moore chose to have her ovaries removed as a preventive measure, and is now getting more frequent breast exams. For Robinson’s daughter Ashley, the decision was more difficult. “At first, I did not want to know,” said Ashley. “I did not want to be tested.” But Ashley says her older sister talked her into being tested for the gene. While her older sister does not have the BRCA malformation, Ashley does. “At first I was like how do you test positive and do nothing about it…so that was kind of hard in the beginning,” said Ashley. But medical oncologist Dr. Steve Madden at Lexington Medical center says at Ashley’s young age it’s okay not to undergo preventive surgery as long as she’s pro-active. “As long as you’re aware, you’re going to be on top of anything and catch it much earlier if it develops at all,” added Dr. Madden. Kathryn has been a survivor now for two years. Her family calls her a lifesaver. “She was very positive, and she inspired all of us to take a fighting approach to it,” said Moore. Dr. Madden says doctors usually advise anyone diagnosed with breast cancer who is under the age of 50 to be tested for the gene. They also advise immediate family members of breast cancer patients to be tested, as well. Upon moving to South Carolina from Los Angeles, California and getting involved in the community, I met so many fabulous people, including the amazing women of the Batesburg-Leesville Women’s Society. Amazing is an understatement when describing some of these ladies. 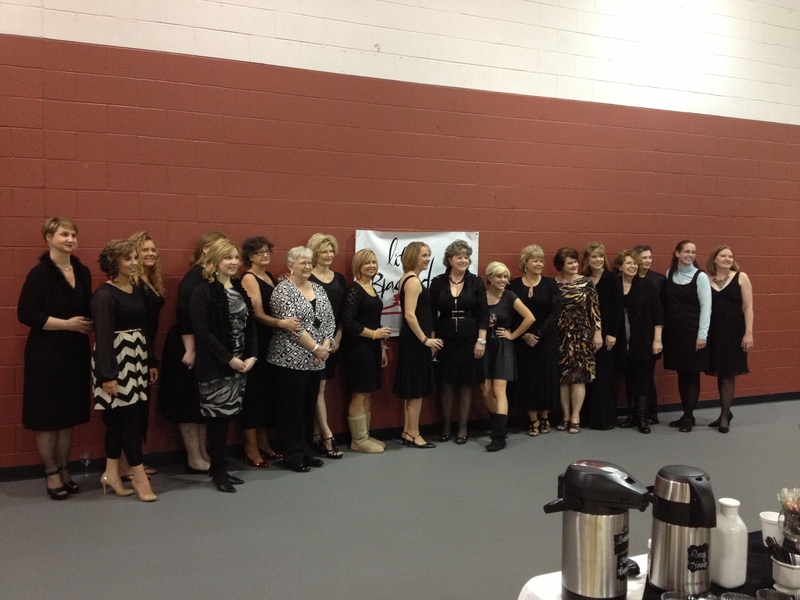 Along with being sweet as can be, masters of incredible cooking, and knowing how to host a seriously fabulous party, these women do so many wonderful things for the community and those in need. Their dedication to helping others is priceless. I was so impressed with this organization! When I was invited to join I did not have to think twice. Though I live in Lexington now, I continue to be a member and be involved with the B-L Women’s Society as much as my schedule will allow. Some of these folks are like family and I will always treasure my relationship with them. I am very proud to be a member of a Women’s Society that does so much good for others. We start each of our meetings reciting the Pledge of Allegiance and the Women’s Society Pledge. At our recent meeting, as we were saying our Society Pledge, it struck me how special this pledge really is and the importance of its meaning. It’s something we could all benefit from reading daily. I felt that our Every Woman Blog family of bloggers and readers should have the opportunity to read this lovely pledge, as it really does serve as a wonderful reminder of the important things in life and how we can live each day with courage, kindness, a helping hand and a warm heart. the great, common human heart of us all. 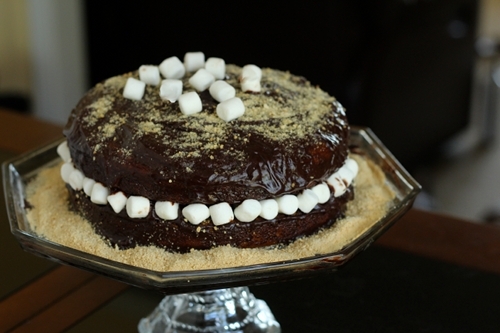 I needed this cake, a Pumpkin S’more Cake, for a Wednesday night dinner. Looking at the recipe, it became clear that the cake had to be made in advance of Wednesday night. I preferred to make it in steps over 2 days, since the recipe had many components, but upon reading the recipe and consulting some baking experts, I decided few of the components actually lent themselves to that approach. Turns out the entire cake I had envisioned was destined to fail, as nearly every component I began to make flopped monstrously I started baking the cake at 4pm on a Tuesday afternoon and it was finally complete at 10pm. I went to bed leaving the kitchen a mess. I had made 5 layers of cake and one batch of failed meringue, and had used two cans of pumpkin and nearly 18 eggs. The fact that I was especially clumsy that night didn’t help the situation. The cake that made it to the dinner was only reminiscent of the cake I originally set out to make. I don’t hesitate to say, however, that it is likely a much more delicious version. The star of the dessert is a perfect pumpkin cake recipe (declared perfect by the queen of recipe comparisons at The Way the Cookie Crumbles). Between those layers of cake was the perfect amount of graham cracker crumbs and soft mini marshmallows. 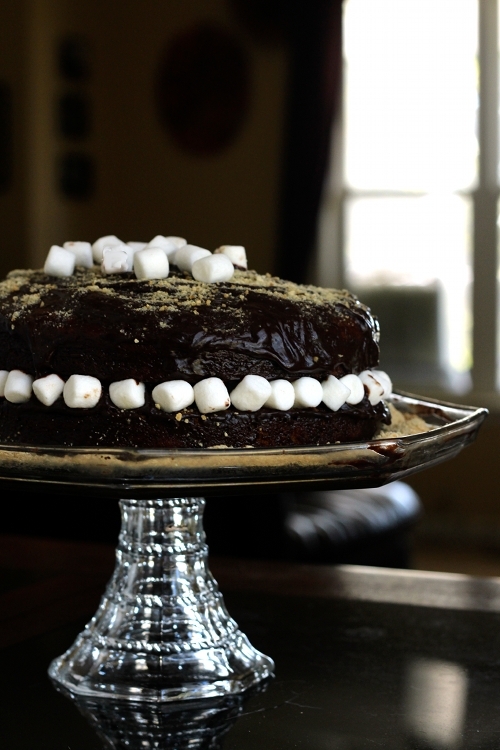 A deep dark chocolate ganache served as the frosting and kept the cake from feeling too sweet when combined with the marshmallows (pure sugar) and fluffy cake. This dessert is perfect for fall, Halloween, or the holiday season coming up. It was a huge crowd pleaser at dinner and in the teacher workroom the next day! Preheat the oven to 350° (175°C). Line two 8″ cake pans with parchment paper. Butter and flour parchment rounds. In a stand mixer, beat the butter and sugars on medium speed until fluffy, about 5 minutes. In a medium bowl, sift the flour, baking powder, baking soda, cinnamon, ginger, nutmeg, cloves, salt, and pepper. Add both eggs one at a time to the mixer, scraping down the sides after each addition. Alternate adding the flour and milk mixtures, beginning and ending with the flour. Finally, beat in the pumpkin until smooth. Rap the filled pans once on the counter to release any air bubbles. Bake the cakes until a toothpick inserted into the center comes out clean, about 20 to 25 minutes. Cool on racks completely. Place the chopped chocolate in a heat-proof bowl. Cook the heavy cream and butter over medium high heat until a simmer. Remove from heat and pour over prepared chocolate. Stir until no streaks remain. Use immediately. Place one leveled cake layer on your cake stand or serving platter. Spoon 1/4 cup ganache over the round and smooth so that the layer is even. Add an even layer of graham cracker crumbs and dot with mini marshmallows, making sure that only one layer of marshmallows is made. Add the next cake layer. Pour/spread remaining ganache over cake. Sprinkle with additional graham cracker crumbs and marshmallows.